The first few years we were full of energy- many of the rooms were redecorated with gusto- sometimes more than once!! 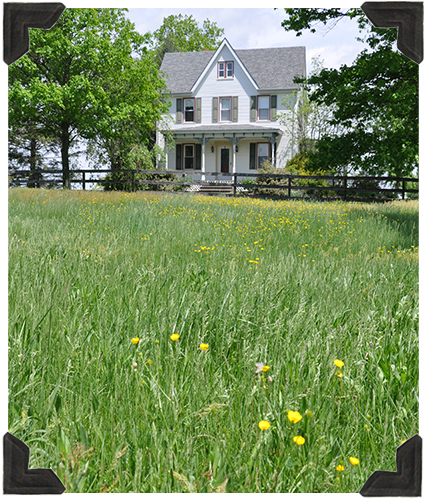 But as the years went on… we ran out of steam (raise your hand if you can relate.) We had a spare bedroom which got very little use, and it became a sad, dark, little “dump-it” room (you know, the place where you stash the stuff that you don’t know what else to do with….) And sorry, I don’t have any before pictures… who wants evidence of that? Finally, enough became enough, and I mustered the enthusiasm and energy to makeover this little room. I wanted it to be cute and cottage-y and comfortable. I wanted sort of a neutral palette, so that I could display my quilts on the bed. I imagined a black, white, and gray room, with a few pops of red (most of my quilts contain red or pink.) It quickly became apparent that that was not enough color for me, nor cheerful enough. So I added some turquoise and yellow accents and it came to life…. I did a lot of DIY projects for the room. In the coming weeks, I will be sharing tutorials for a lot of those projects, and then I will do a final “Reveal” of the entire room. So stay tuned! 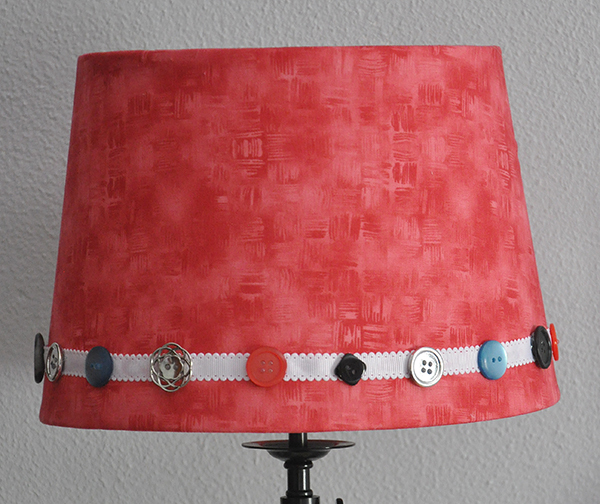 As part of our spare bedroom makeover, I thought it would be fun to dress up some lampshades. I got these very basic lamps at Target, but I’ve also covered the lampshades on flea market finds- and oh-what-a-difference it makes! Amazing! And by the way- this is a totally No-Sew project! Glue– Tacky glue or a glue gun. I like the Tacky glue because I can slide my fabric into place if I don’t get it exactly where I want it the first time, and I hate having the glue gun’s inevitable burnt and blistered fingers. But it’s up to you. To begin, you will need to make a template. 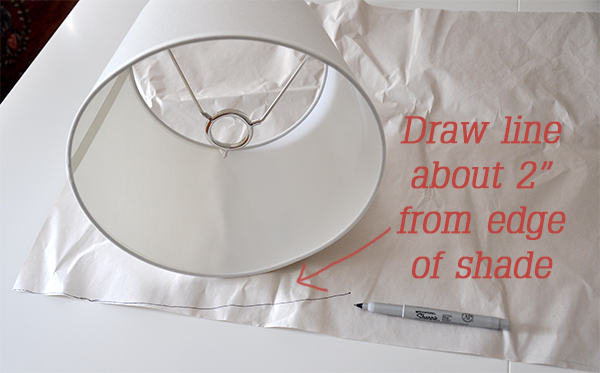 Place the lampshade on the paper, lining up the seam on the lampshade with the edge of the paper. 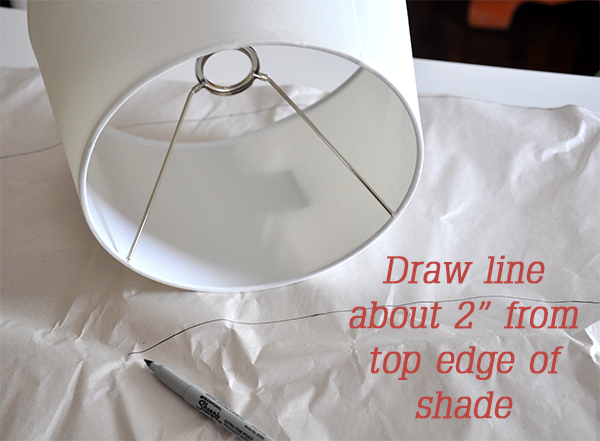 Draw a line about 2” from the bottom edge of the shade. 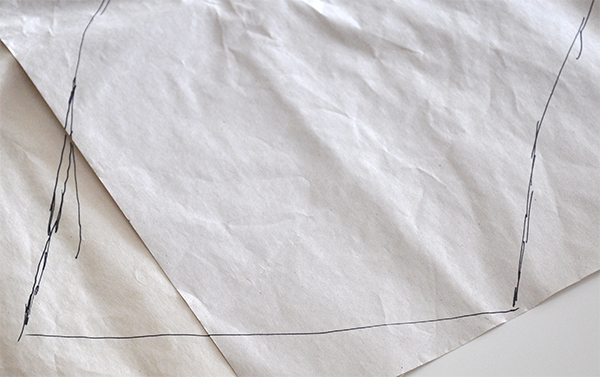 Slowly roll the shade along the paper, marking a line as you go. 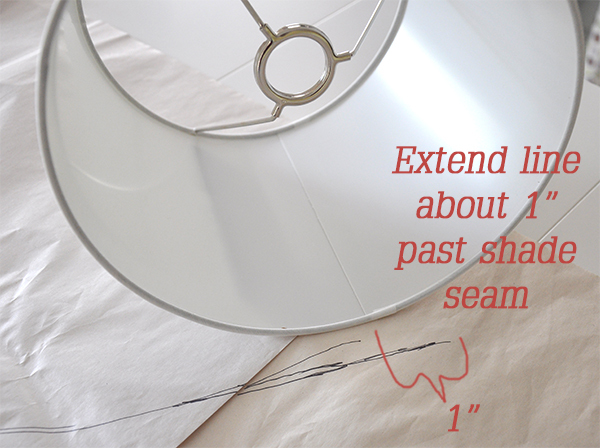 When you come back to the seam on the lampshade, extend the line another inch beyond the seam. 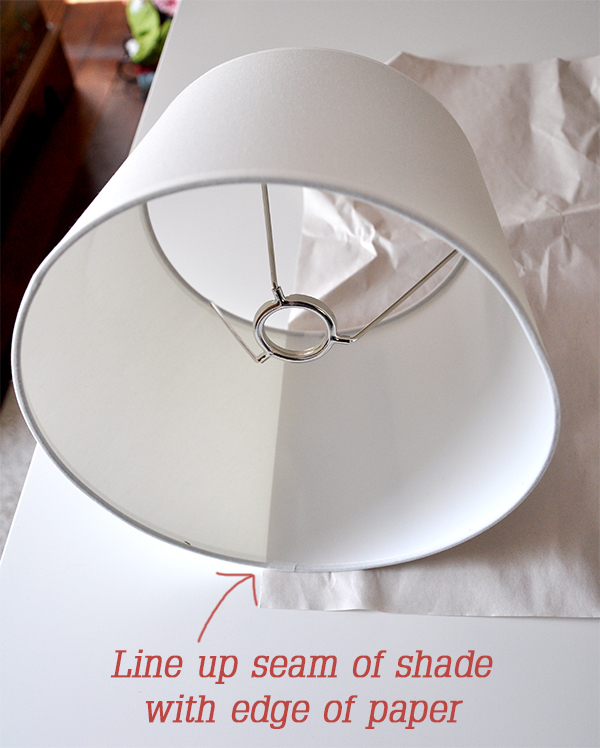 Line up the seam of the lampshade with the edge of the paper again and repeat, marking a line about 2” above the top edge of the shade. 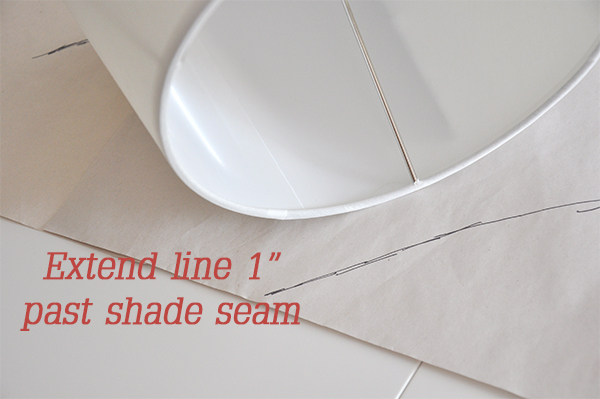 Once again, extend your drawn line about 1” beyond the seam of the shade. Draw a line to connect your ending points. Cut out the template. 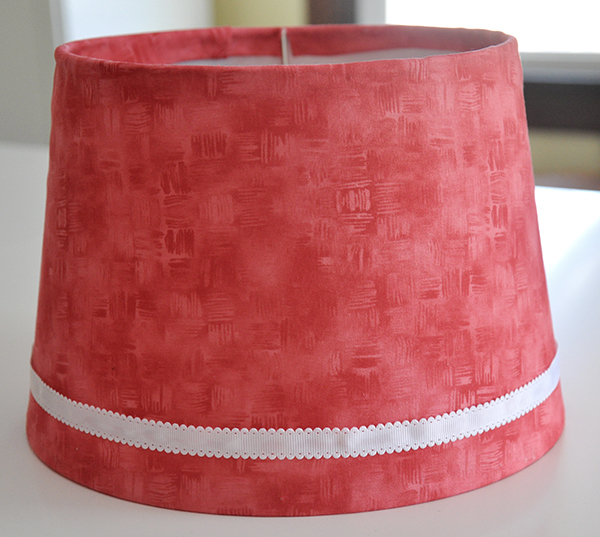 Try out your template on your lampshade to make sure that the ends will overlap by about 1” in the back, and that you have at least 1” of extra fabric along the top and bottom. 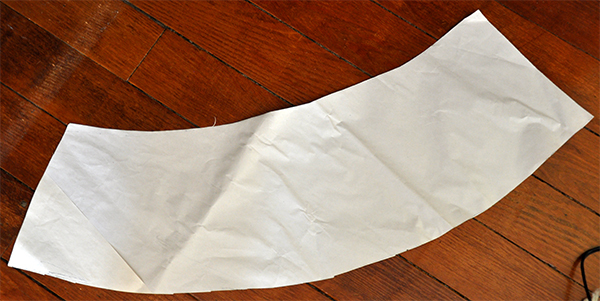 Pin paper template to fabric and cut out. Place the lampshade on the wrong side of the fabric. Roll the shade along the fabric to make sure that the fabric extends at least 1” beyond the top and bottom edges of the shade. 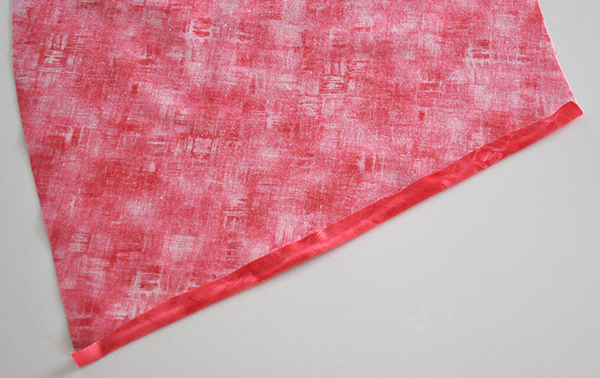 Fold down one of the edges of the fabric about 1/4” toward the wrong side of the fabric. Glue in place. 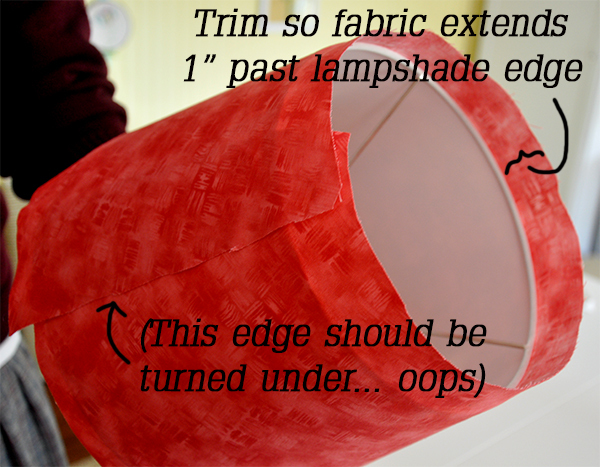 Place glue on top and bottom edges of lampshade. 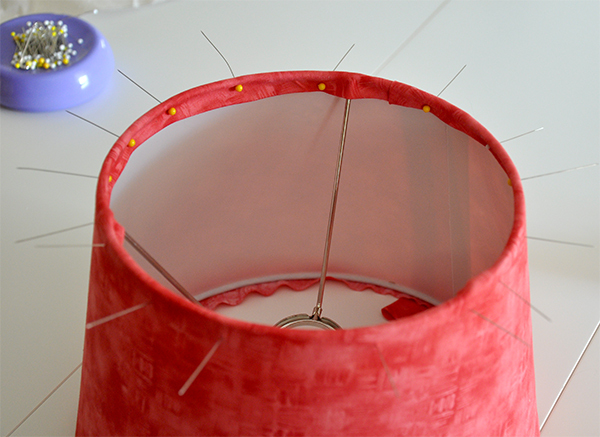 Working from the front of lampshade, glue on fabric. 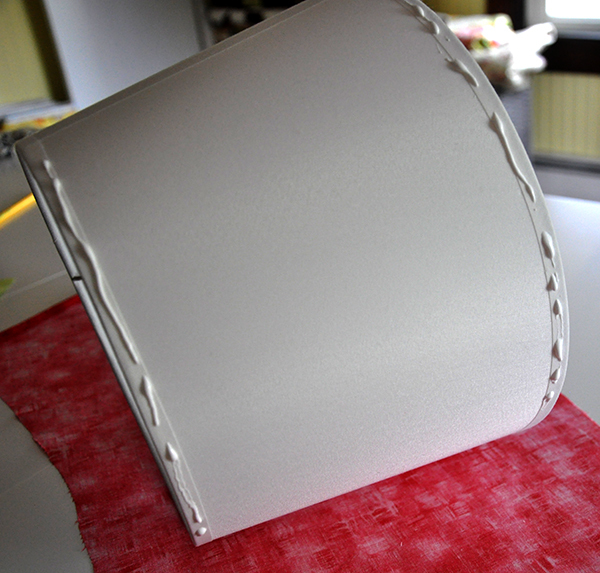 On the back of the lampshade, place the folded seam over the raw edge. 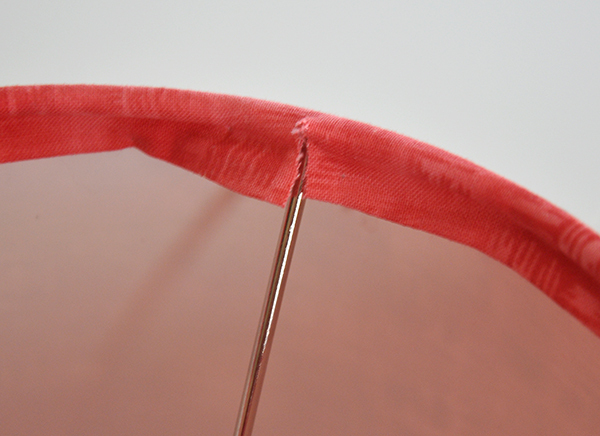 Trim the top and bottom edges of fabric as necessary so that it extends about 1” from the top and bottom edges of the lampshade. Now you will need to glue down the top and bottom edges of the fabric. 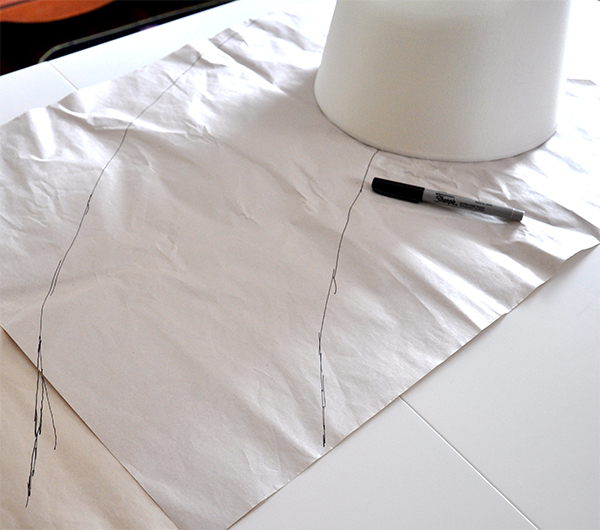 Fold the fabric toward the wrong side about 1/4”, then fold again over the top of the lampshade. Glue in place. 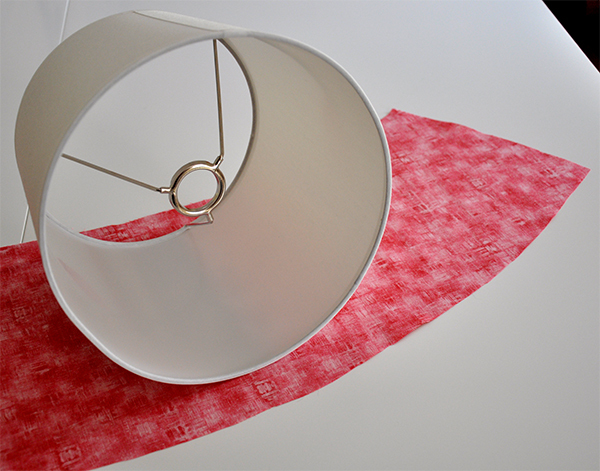 Snip the fabric over the wire frame of the lampshade so it lays flat. 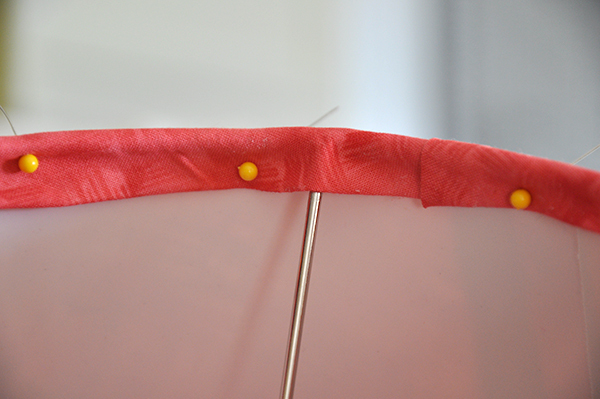 If you’ve used Tacky glue, use straight pins to hold in place until glue dries. 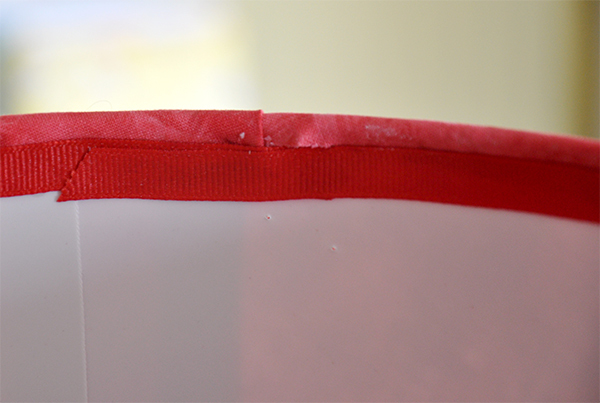 I had some pretty white ribbon to glue around the shade. 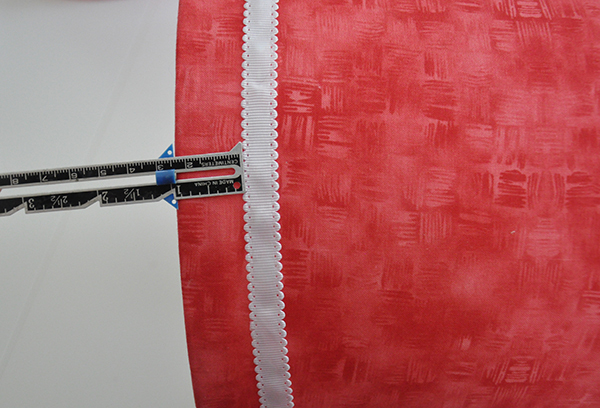 Here is a little tip- a hem gauge, which you can pick up in the sewing notions department, makes it super easy to get your trim in exactly the right place all the way around the lampshade. Isn’t it cute? But I think it still needs something else…. I think a variety of mismatched buttons will do the trick! Ta-da! 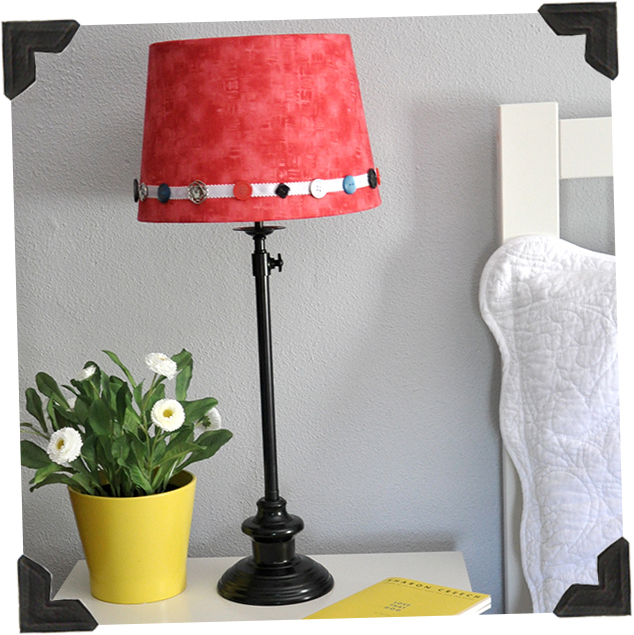 I made 2 shades for the nightstand lamps, and they really add a little personality and charm to the room. 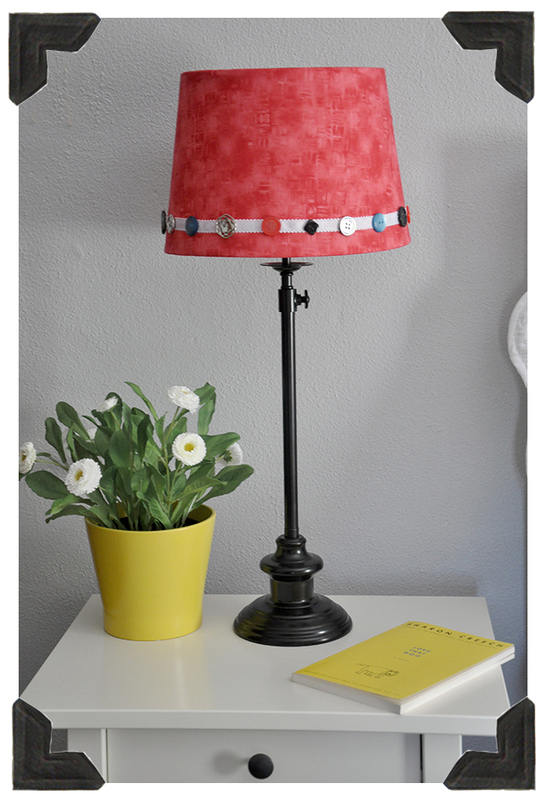 Have you ever tried covering lampshades with fabrics? Or have you tried other ways of decorating them, such as paint? Please share your ideas with the rest of us! Click here for more crafty project ideas! That’s such a clever way to spruce up a boring lamp! Not to mention adding color and life to a tired room! My guest room is like yours used to be – definitely in need of brightening up. I still have a few more projects to do in there, but it is a definite improvement…. Your lamp looks great Jacquelynne. Adorable! Can’t wait to try this in some different colors for my girls room! Your lampshade turned out beautiful. It looks like a project that doesn’t take too long and you can really make it fit your own decor with the embellishments. Yes Judy, that’s the beauty of it- You can take any old lampshade and personalize it to any decor and any room in your house. I think rick rack or pom pom fringe would be really cute, don’t you? 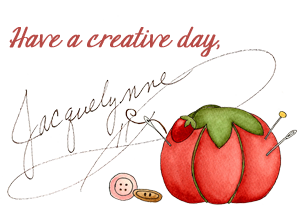 Just popped over to the new blog….it’s wonderful! Love this project, too. Hope your Market trip went well, and that you and yours have a lovely holiday weekend. Hugs! You know… I ended up not going to Quilt Market. Since it was in Portland OR, and I live in NJ, it was a little far to go this time. But I did take my daughter to NYC for the weekend and I’ll have those photos on my blog later this week. Please stop back and take a peek!